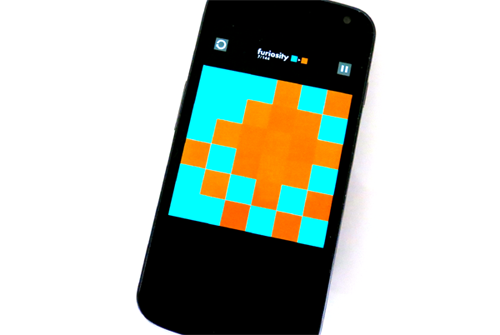 Big news today because the third bontegames app just went live: enjoy furiosity! After sugar, sugar and factory balls I have created a new puzzle app for Android and iOS phones and tablets. Furiosity started as a browser game for a game jam last year, but now it was completely redesigned for mobile with a lot more levels. Strip away every layer of the game. Every level has its own logic. There are 144 levels! Can you solve them all? Get it for Android or for iOS. Cheers! And I too, would love more Factory Balls for my tablet. Haven't seen any like this, best mobile game on my phone!! So very sad, my phone is stupid and connected to the wall by a wire. It has a dial that spins around and lights up when you pick it up! Fun, but not as much fun as your games Bart! I'll be grabbing this soon for ios. Thanks for the work, Bart! I'm at level 102 and I have not regret buying it! will you be giving out any promo codes? i am currently up to level 37 and so far i love this app! I can't get level 45 to do anything. Help? For level 45: there is one block that will invert all other blocks: keep tapping on column 5 row 4, cheers! Also stuck on 141. I think it is necessary to get a green in one corner with two oranges coming off from the horizontal and vertical sides but I can't get it right.